Download PS Form 3575, also known as the Printable USPS Change of Address Form is available for anyone who is changing their address. Fill-in and send to the USPS for the purpose of having mail forwarded to the new address promptly and to stop mail service in your name, at the old address. Anyone who will changing their address should do this as soon as possible after the new address is secured. 4. If Temporary move, print date to discontinue forwarding ( in mm/dd/yyyy format )- This action will discontinue mail service to your temporary address and begin returning mail to your old address, so be certain that you are ready for mail to return to your old address for the safety of your private information. 5. a. – Last Name & Jr./Sr. etc. Step 2 – Section 7 a. through e. – Print Old Mailing Address: House/Building Number and Street Name (Include Ave. Ct. etc.) Or PO Box. Step 3 – Section 8 a., through e. – Print New Mailing Address: House/Building Number and Street Name (Include Ave. Ct. etc.) Or PO Box. Read the conditions at the bottom of the form before signing. Step 5- Print and mail to: Postmaster, United States Postal Service. This is all that is needed for an address to send the form through the mail. You may also take it to your local postal location for further assistance. 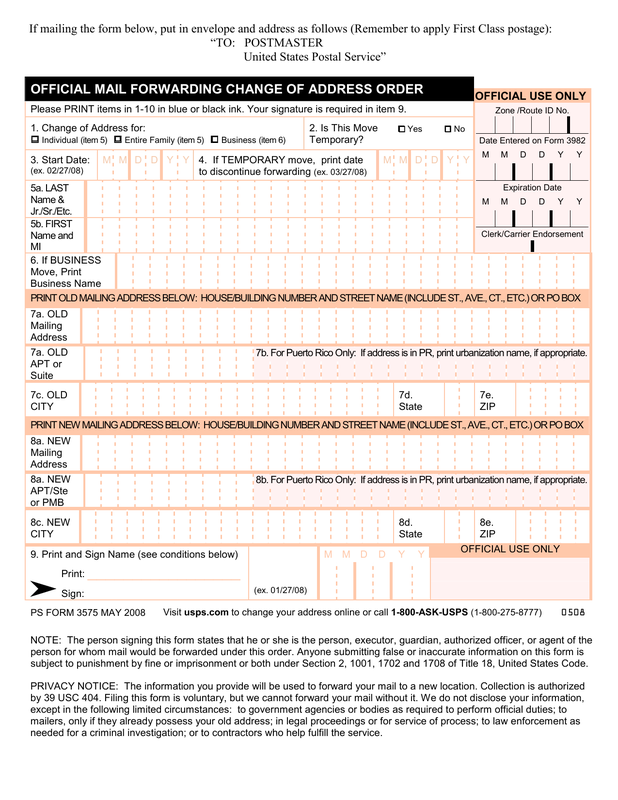 Online Change of Address: If you would prefer to complete this form online, simply go to USPS.com. The last selection in the white box on the left, on the home page, will be the change of address link or go to this link (https://moversguide.usps.com/). From here follow the prompts to change your address online. The charge for this service is $1.00.